Very early in life, Dada came under the influence of a great Spiritual Master, Gurdev Dada Chellaram Sahib, who instilled in him the love of Gurbani and set his heart ablaze with fiery devotion that consumed his entire being, body, mind and soul. 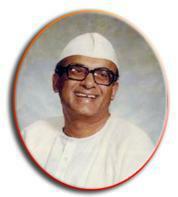 Dada Ishwar was a dynamic personality. He sprinkled the nectar of Ram Nam through his nectarian kirtan and katha. One could feel the subtle lyricism reflecting itself on his face as he sang. He looked an entirely different person for he sang with his soul in his voice. He followed the path of supreme Prema Bhakti sacrificing all he possessed at the altar of his true Love, the Lord of Brindaban. Amrit Vela, the ambrosial hours of the early morning, was the very breath of his life, the time he spent in prayer and contemplation to communicate with his Beloved. Dada Ishwar remained a bachelor. Coming from a wealthy family, he embraced poverty and lived simply with very few basic needs. This frugal life style suited Dada beautifully for he could then use time saved more profitably for higher pursuits. Dada will be most remembered for establishing the Sindhi Community House in the year 1987 with its beautiful temple and centre of service. This is a place of great pride for Sindhi’s not only of the U.K. but all over the world. Holy Mission of Guru Nanak, of which Dada Ishwar was the founder, has Centres in India: the well-known Amrit Vela Ashram in Khandala and Amrit Vela Mandirs in Pune and Kolkata. The selfless workers here, inspired by Dadaji’s ideals, actively pursue the twin objectives of Simran and Shewa through the nectarian Kirtan and service of the poor. Their commitment to the cause is a testimony to revered Dada’s extraordinary sacrifices and devotion. To alleviate human suffering, a charitable dispensary on the premises of Pune Mandir was established and also a programme of feeding the poor in the Mission’s various centres in India. Dada Ishwar was deeply devoted to the beautiful land of Sind, its culture and the great sons it produced. Numerous pictures of these personalities adorn Amrit Vela Ashram (Khandala, India) and the Sindhi Community House in London. Through plays and musical performances, he shared his spiritual joys with the whole world and showed to his people the vast treasure they as Sindhis possessed in their tradition and culture. Many will fondly remember the joyous annual festivals or Melas organized in the Ashram under Dada’s guidance. These attracted Sindhi artists and visitors from Pune, Mumbai, Ulhasnagar and other places in India. Dada Ji in the early years As a wandering Minstrel, this revered saint travelled the world at least 20 times charming all hearts with his melodious kirtan and organizing spiritual and cultural dramas. It was a strange and exhilarating experience to see children and youngsters perform plays in our sweet Sindhi language which earned Dada undying gratitude of the community. One wonders what it is that makes some of the great men so lovable. Is it their quality of greatness, loftiness, saintliness? The answer is none of these qualities go to make them as lovable as their only shortcomings which put them at on the same footing with the rest of us. It is their giving away of themselves to others, that makes them so much loved. Our Dada was like one of us in this respect, intensely human in his relationship with his people. To him, the devotee workers were dearer than his own life. To them, he was an answer to their seeking souls. With infinite patience he tried to mould their imperfect nature watching every movement vigilantly and tenderly. As a teacher, he used the hammer only to chisel them into beauty and perfection. As one looks back, Dada’s whole life appears as a life throbbing, pulsating, vibrating and overflooding its bounds. Inspite of great physical suffering, dear Dada worked ceaselessly, conducting kirtans with great ferver, which gave no indication of his approaching end. But it was not possible for his body to keep pace with the overflooding rush of his mental inspiration. Finally the soul flew on its beautiful wings into the lap of the Lord. Dada Ishwar Balani left for his heavenly abode on Friday, 5th March, 2004 leaving behind a grieving Sindhi community not only of London but of the world. Many close workers of the Mission gathered from outside the UK to pay homage to their beloved teacher and companion who had so profoundly touched their lives. Who possessed nothing yet was a king amongst men.